Providing performance across a range of SUVs, passenger vehicles and vans. 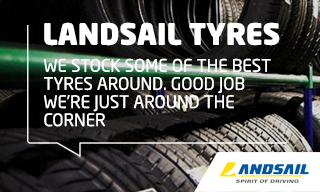 One of the most advanced and fastest-growing tyre brands in the UK, Landsail is a company that focuses on performance and safety across the range. Despite its short period of time in existence, the company has a large capacity for tyre production and has created tyres for a number of vehicle types. As well as putting a real focus on high performance, Landsail produces both winter and all weather tyres that ensure drivers have the right tyre for their car throughout the year. Landsail CLV6 - Designed specifically with the ride quality in mind, the CLV6 is a tyre built for smooth and comfortable performance. Developed for SUVs, the tyre's diversely distributed tread blocks maximise the dampening characteristics of the tyre to give a real comfort in every journey. The outer blocks of the tyre also allow for smooth cornering and a responsive performance while the tyres are designed using a progressive compound that enhances grip in all weather conditions. Landsail LS588 - Created for all-round performance, the LS588 SUV is a tyre that works in all conditions and for all drivers. With an excellent balance of fuel efficiency, dry and wet weather grip, and low-noise characteristics, it can be used year round without drivers having to worry about a dropping in performance quality. Lateral and longitudinal grooves deliver more control for the driver, while the additional sipes and grooves improve hydroplaning resistance to give better safety on the road at all times.